This is a variation of one of my go-to appetizers. A few ingredients, super easy to prepare and loved by most everyone, it’s pretty perfect. Although I call it an appetizer I’ve been known to make it my entire meal on more than one occasion! Make sure the ricotta is well-drained. Mix the ricotta with the dill, green onion and capers. 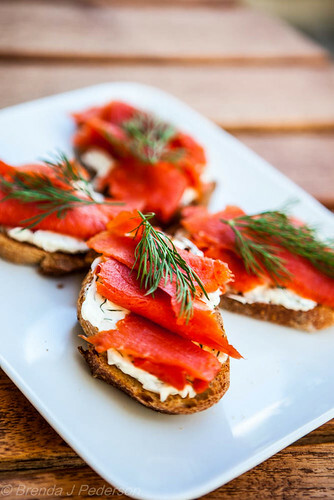 Spread the cheese on the baguette slices; top with a slice or two of smoked salmon; garnish with a little bit of dill. Eat and enjoy!